The Huawei P10 is one of those phones that snatches defeat from the jaws of victory. In baseball, the P10 would be a home run that winds up being a double because some dumb fan caught the ball and threw it to third base. The P10 is so close to being a killer phone, and yet it falls disappointingly short. I have no complaints about the basic hardware. Aside from the too-familiar design, Huawei pieced together a nice set of high-quality materials in a compact form that's a pleasure to use day in and day out. Call quality is very good, data speeds are fine, the screen is nice (though prone to grime), and battery life is outstanding. The camera app is incredibly powerful and produces mostly excellent results. Huawei's Emotion UI could be better. The biggest problem is how Huawei treats the fingerprint button. You're better off ignoring its duplicative and confusing navigation actions in favor of the simpler on-screen controls, even though they're not great. Then there's the price. Unlocked phones have their own appeal, and dual SIM phones even moreso, and people are often willing to pay a small premium to get these features. And yet the P10's $685 price point feels too high. It costs more than the iPhone 7 and LG G6, and doesn't quite perform on par with either. If you need support for two SIM cards, the Huawei P10 is one of the better options in the market. If not, most people will be better served by a more mainstream handset that has fewer tradeoffs. Huawei today announced the P10, its new mid-size flagship phone for 2017. 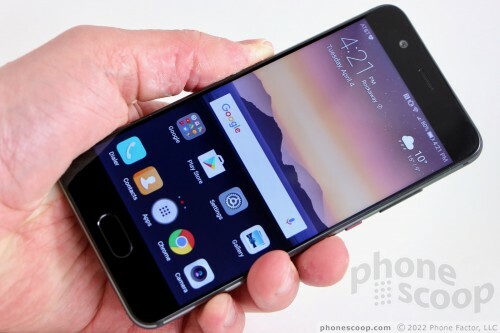 The phone is similar in size to last year's P9, but with more rounded sides and corners to make it feel thinner.